One of the foremost colleges of the University of Oxford is also the cathedral church of the diocese of Oxford. The building’s history dates to 1525 when Thomas Wolsey, Lord Chancellor of England and Cardinal Archbishop of York founded the Cardinal College and started with the construction works. However, he fell out of favour as early as 1529 and the building was left incomplete. The construction works were resumed after the college was re-founded as Christ Church by King Henry VIII in 1549 but the buildings were finally completed only after the end of the civil war and restoration of the monarchy in the second half of the 17th century. Besides of its rich history and splendid architecture, the Christ Church is also proud of its famous students of which 13 became British Prime Ministers including Archibald Primrose, Robert Peel and Anthony Eden, to mention only a few. The college was also attended by many other influential politicians from both Britain and abroad. The Christ Church was also attended by Canadian politician Ted Jolliffe, American statesman Charles Cotesworth Pinckney and former Pakistani Prime Minister and father of Benazir Bhutto, Zulfikar Ali Bhutto. Oxford University’s main research library and one of Europe’s oldest libraries is second in size (in Britain) only to the British Library. It occupies five buildings at Broad Street with a history dating back to the Middle Ages such as the Duke Humfrey’s Library to the first half of the 20th century such as the New Bodleian, housing valuable manuscripts and rare books including: four copies of the Magna Carta, 14th century Vernon Manuscript, 9th to 10th century Greek manuscripts called Codex Tischendorfianus III and IV, one of only 21 surviving complete copies of Guttenberg Bible and William Shakespeare’s 1623 First folio, to mention only a few. Built between 1664 and 1668 according to the design by Christopher Wren, the theatre was named after its commissioner Gilbert Sheldon, at the time chancellor of the Oxford University. 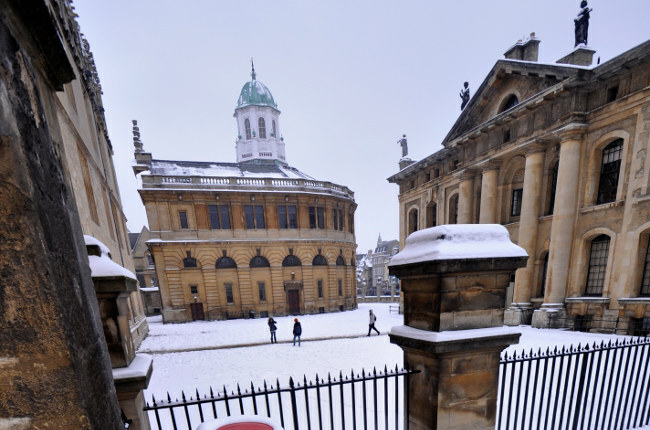 Ever since its completion, the Sheldonian Theatre is used for music concerts, recitals, lectures, conferences and various university’s ceremonies. Interestingly, it doesn’t host dramas. Virtually all venues of the Sunday Times Oxford Literary Festival have wheelchair accessibility. Rooms in upper levels have either lift, platform lift or stair climber. Please contact the Festival’s team or box office for further information about accessibility for the disabled and make arrangements if necessary.